Today we are happy to get with our good friend Brandy the general manager, to tell us about this new Nashville wedding venue The Barn at Sycamore Farms. 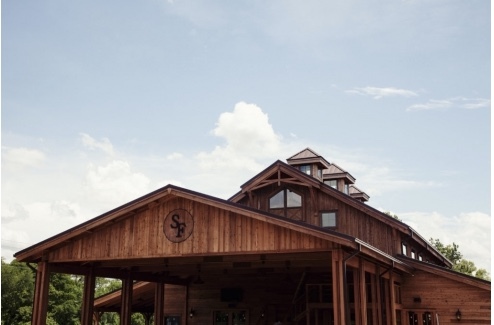 The Barn at Sycamore Farms is a brand new event venue located on 28 acres in the heart of Arrington, Tennessee capable of accommodating up to 400 guests. Our barn features cedar beams, crystal chandeliers, bridal and grooms suites, stone benches, two verandas overlooking the only island ceremony setting in Tennessee. A stone bridge leads guests to the 9,000 sq.ft island. The island can seat up to 400 people and is completely surrounded by a 2 acre lake. Our main hall features a custom made 8 ft. crystal chandelier. Heat and air conditioning and the latest lighting and audio video technology is available. Most importantly, our barn is heated and cooled and is designed for all seasons and weather conditions. Heat/air conditioning, our large capacity, and our island ceremony setting to name just a few. One of the largest advantages of our barn is the heat and air conditioning. We have 3 separate systems to keep everyone comfortable. The main hall has a unit, as well as a unit for the bridal suite, and a unit for the grooms suite. At the touch of a button the bride and groom can easily adjust the temperature in their room to remain comfortable. Another feature that sets us apart is the lake and island. Many have a lake, but not an island capable of seating the entire wedding party and guests. In the same way, our main hall is large enough to seat 300 guests and covered verandas can seat 150-250 more guests. The verandas also offer a stunning view of the lake, island and 100 year old Sycamore tree. Our goal is provide as many modern conveniences to the bride and groom as possible. The bridal suite offers makeup stations, plush seating, large flat screen TV, farm table for dining, private restroom and 3 crystal chandeliers. The grooms lounge offers leather seating, shuffleboard table, poker table, foosball table, large flat screen TV and a private restroom. We also offer lighting, audio video, wireless microphones and props for decorating. Our owner was raised in east TN and grew up loving the Tennessee countryside. He had a vision of grand barn venue for events after he saw the property’s 100 year old Sycamore tree. It is said that a 7 prong Sycamore tree is good luck…we agree. The sky is the limit! It depends on the size of the wedding and the couple’s preference. Ceremony locations include the island, inside the barn, under the Sycamore tree and inside the barn in the main hall. The couple has exclusive use of the entire property for the day so where they choose to hold their events is up to them. We have an extensive preferred vendor list for the bride to choose her vendors, but if she wishes to use vendors outside the list she can buyout that clause in her contract. We’ve only been open a week and have already hosted 2 events! But both events showcased the barn’s versatility. The Canadian skirl cedar wood that the building is constructed of inside and out offer a raw but refined look, so the barn can be easily transformed to their taste.